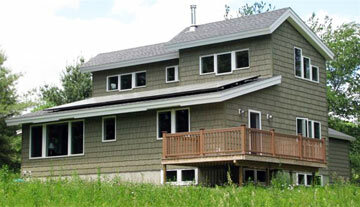 Richard Sherman designed and built the award-winning Ashford home of Cindy Moeckel and Larry Grasso, voted the most energy efficient building envelope in the CT Zero Energy Challenge 2010-2011 contest for houses built in 2010. The award ceremony will be held in March 2012. The Connecticut Energy Efficiency Fund, in partnership with Connecticut Light & Power and The United Illuminating Company, issued a design/build challenge last year to Connecticut participants. This competition challenges home builders and homeowners to reduce energy consumption and overall environmental impact when building or renovating their home. Richard L. Sherman, the winner of this year’s ZEC, met the challenge with his ‘zero energy design’ using diverse methods and strategies. Ashford homeowners Cindy Moeckel and Larry Grasso wished to incorporate a zero energy design concept into the plans for their new home. The couple collaborated with Richard L. Sherman, the owner and chief designer at Appropriate Designs in Mansfield Center. Together, their goals were achieved. More information about Richard Sherman’s award-winning Ashford home was published in the Norwich Bulletin on January 17, 2012. Read the online article by clicking on the link below. An important facet of the team approach is the early and continuous involvement of other design professionals and trades people that we have worked successfully with in the past. Our projects and clients throughout eastern Connecticut who have been the beneficiary of our work are glad to offer their observations and endorsements for your consideration.